Robert Gillespie's mother was Jane Pollock, who came from a farming family, and his father was Thomas Gillespie who was a butcher in Johnstone. Robert was educated first at Johnstone Primary School and then at Johnstone High School. He left the High School in 1917 and entered Paisley Grammar School. He completed his school education in 1920 as dux of the Grammar School and entered the University of Glasgow having won a Patrick Bursary. He graduated with an M.A. with First Class Honours in Mathematics and Natural Philosophy in 1923, then in the same year was awarded a B.Sc. in Mathematics, Natural Philosophy and Astronomy. Having won a William Bryce Fellowship to undertake research, he spent three years 1924-27 at Cambridge with his studies directed by E W Hobson. 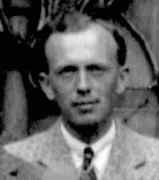 Gillespie was appointed as an assistant in the department of Mathematics at Glasgow University in 1929 and three years later was awarded a Ph.D. from the University of Cambridge. He began to publish a series of important papers in the Cambridge Philosophical Society and in the Proceedings of the Edinburgh Mathematical Society. After the start of World War II in 1939, Gillespie served briefly on a part-time basis on Clyde River Patrol. He then joined the Royal Air Force and was stationed at Prestwick involved in Air Traffic Control over the North Atlantic. In 1948 he was promoted to Senior Lecturer in Mathematics, a position he held until he retired in 1969. Robert Gillespie was a member of the Edinburgh Mathematical Society, joining in December 1925 when he was a research student at Cambridge, although the address he gave was that of his parents: Ashcot, Kilbarchan Road, Johnstone. He served twice as President of the Society, first in session 1946-47, then again in session 1967-68. He was elected to the Royal Society of Edinburgh on 6 March 1933, his proposers being Thomas Murray MacRobert, Neil McArthur, Richard Alexander Robb, William Arthur. An obituary, written by Robert A Rankin, appears in the Royal Society of Edinburgh Year Book 1978, pages 31-32. The first four chapters are devoted to an elementary account of integration, no attempt being made to be rigorous. The following chapters penetrate deeper into the classic Riemannian theory of integration. Contents: Introduction. Integration of elementary functions. Multiple integrals. Curvilinear and surface integrals. The Riemann integral. Infinite integrals. The Riemann double integrals. Robert Gillespie was married to Maisie Bowman, the daughter of Professor A A Bowman. Their son Alastair Gillespie is a mathematician who has also been President of the Edinburgh Mathematical Society, serving in this capacity from 2001 to 2003.